In this week’s Parashah, we read of the Mitzvah to build the Mishkan / Tabernacle and, later, the Bet Hamikdash. R’ Shalom Noach Berezovsky z”l (1911-2000; Slonimer Rebbe in Yerushalayim) writes: The Bet Hamikdash is the “soul” of all of Creation. [Like the spiritual soul in the midst of the physical body,] Hashem sent a “light” from the upper worlds into this world of lowly physical desires in order to elevate the Jewish People. The service in the Bet Hamikdash and the Keilim / implements and furnishings there brought purity to Klal Yisrael, giving them the strength to persevere in the “darkness” of this world. In this way, we may explain the verse, “They shall make a Sanctuary for Me — so that I may dwell among them”– within each and every one of them. The Bet Hamikdash purified every Jew so that the Shechinah could dwell within him. The Slonimer Rebbe continues: The Bet Hamikdash, a geographical place (“Makom”), has a parallel in the dimension of time (“Shanah”). 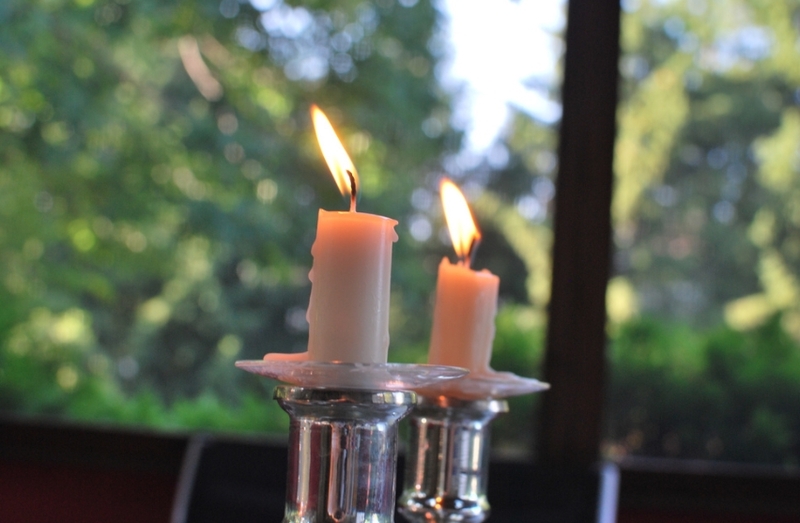 That is Shabbat, which brings holiness to the Jewish soul no matter how lowly its condition. In the words of our Sages, “If someone keeps Shabbat with all its laws, then even if he worships idols, he will be forgiven.” Shabbat is the opportunity for every Jew to “come home,” even from the depths of lowliness. The Aron / Ark was two-and-a-half Amot long, one-and-a-half Amot wide, and one-and-a-half Amot tall. The Aron housed the Torah, R’ Ettlinger explains, and the horizontal dimensions are not whole numbers to remind the Torah scholar that his studies are never completed. The height is not a whole number to remind the Torah scholar that, although he must act dignified in front of other people in order to preserve the Torah’s honor, inside, he must remain humble. The Shulchan / Table was two Amot long, one Amah wide, and one-and-a-half Amot tall. The Shulchan symbolizes wealth, R’ Ettlinger writes, and the whole numbers represent being happy with one’s lot, which is what truly makes a person wealthy. One of the dimensions includes a half to remind a person to exercise restraint eating, drinking, and other material pursuits. The Menorah had no specified dimensions. The Menorah alludes to the soul, as we read (Mishlei 20:27), “Man’s soul is a lamp of Hashem.” Spiritual things take up so space; hence, the Menorah had no fixed dimensions. All of the dimensions of the altars were whole numbers, reminding a sinner who is bringing a sacrifice to achieve atonement that he should repent whole-heartedly. Rashi comments: “And so shall you do”– for future generations. R’ Moshe Hager z”l (1916-2012; Vizhnitzer Rebbe) writes: Some people find it difficult to give charity because they think that their wealth is the product of their hard work. They fail to realize that they are mortal beings just like the person asking for tzedakah; that but for G-d’s decree, their positions in society could just as well have been the reverse. They continue: “Five Amot [long and five Amot wide]”–paralleling the Aseret Ha’dibrot / Ten Commandments–five on one tablet and five on the second tablet. R’ Chaim Zaichyk z”l (1906-1989; Rosh Yeshiva of Yeshivat Bet Yosef-Novardok in Buchach, Poland; later in Israel) asks: Where do we find Miriam playing any role in the redemption of the Jewish People? He explains: First, Miriam was the catalyst for Moshe’s birth. Our Sages teach that, when Pharaoh decreed that all newborn boys be killed, Miriam’s father, Amram, separated from his wife Yocheved. Miriam rebuked him, saying, “Pharaoh only decreed against the males. Your action will result in no girls being born either.” Amram then reunited with Yocheved and Moshe was born. Also, when Moshe was placed in a basket in the river, it was Miriam who kept watch over him, and it was she who went to bring Yocheved to nurse Moshe on behalf of Pharaoh’s daughter. Because of Miriam’s devotion to, and self-sacrifice for, Moshe, she is considered a partner in his redemption of Bnei Yisrael. R’ Ben-Zion Yadler z”l (1871-1962; “Maggid / preacher of Yerushalayim”), describes in his memoir, B’tuv Yerushalayim, some outstanding members of Yerushalayim’s working class at the turn of the 20th century. R’ Shmuel Schneider, who sewed garments in the Yerushalmi style, conducted his business honestly and set aside much time for Torah and prayer. One who didn’t know him would think he was one of the great men of Yerushalayim and one of its dignitaries, for his wisdom shone on his face. When R’ Yitzchak (Itzele) Blazer zt”l [1837-1907; one of the most prominent students of Rabbi Yisrael Salanter z”l] settled in Yerushalayim, he sent for R’ Shmuel to come and take his measurements so that R’ Shmuel could sew Yerushalmi garments for him. When R’ Shmuel arrived at his home, the sage thought that one of the rabbis of Yerushalayim had come to welcome him to Eretz Yisrael. Immediately, R’ Itzele stood up and invited his guest to sit, and they discussed Torah and mussar (character improvement) subjects together for a long time. Finally, R’ Shmuel got up and said, “Forgive me, rabbi. Please allow me to take your measurements as I was summoned to do.” R’ Itzele was astounded and said, “Indeed! This is the Yerushalmi tailor, and I had no idea. Fortunate are you, Yerushalayim, that a tailor such as this lives in your midst.” . . .
R’ Naftali Meller (the painter) and R’ Herschel Blecher (the blacksmith) both served as representatives of the congregation [i.e., chazzanim] in the large Menachem Zion shul in the churvah / ruin of Rabbi Yehuda He’chassid on yom tov and the High Holidays. They were exceptional Torah scholars and possessed extraordinary awe of G-d. They were among the most important of the mussar scholars in Yerushalayim. All of this and more were the fruits of the sacrifices that the earlier generations, who were like angels, made to attain awe of G-d. Even the youth who were apprenticed to tradesmen acted like mentschen and overflowed with Torah and awe of G-d. Alas, alas, for that which is lost but not forgotten!